When your garage workshop is home to seven different industrial sewing machines, you better crank up those tunes. 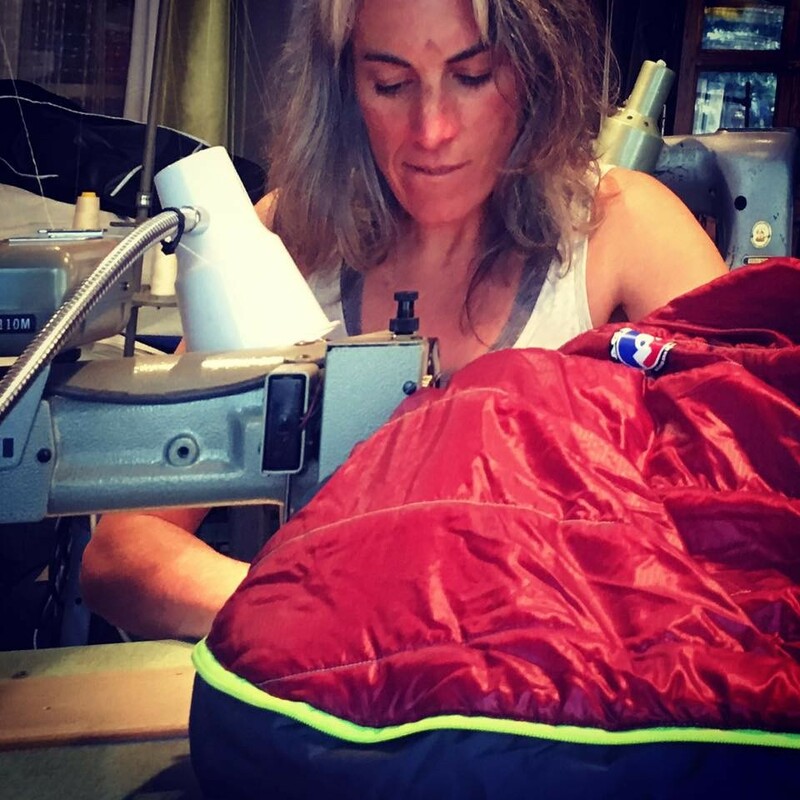 During our phone call to set up this interview, outdoor gear-repair extraordinaire, Kim Kinney, sounded like she was talking from the floor of a factory going full tilt. So a couple days later, when we settled in to talk, she first had to turn down the volume on the Rolling Stones so that we could hear ourselves. Statistics show that 11 million tons of outdoor gear end up in landfills every year, according to Kinney, so she's combatting this by meticulously repairing one outdoor gear item at a time. "What we're trying to do is reduce all that waste by repairing. Our specialty is the lifelong repair of your outerwear to keep it out of the landfill." This can be done, she adds, "because people are attached to their stuff." And it's not all clothing. Kinney repairs a lot of soft-sided luggage, tents, tarps, sleeping bags, you name it. For locals—75 percent of her customer base are walk-ins—but also for big name brands. Her clients include REI, Patagonia and Bend-based companies Giant Loop, that outfits motorcyclists, and Pine Mountain Sports. Kinney also repairs jackets and pants for the Mt. Bachelor ski staff and for the outdoor leadership programs at OSU-Cascades and COCC. And then there's the mail order; each week she averages 5-10 pieces mailed from various locales such as New York, New Jersey, Pennsylvania, Washington, Alaska and Canada. "People just find us," she says. "I consider myself an artist, an engineer and a craftsperson with some business savvy," Kinney says. "I have a love for people and I love my customers," who often share stories about their gear and what it means to them. "I can contribute to people's happiness, and that in turn makes me happy." Kinney has been in the repair business for 27 years, ever since she started working as a tailor in the Utah-based, Snowbird ski resort. Her family moved to Bend in 2004, and she started working out of her garage in 2011. Kinney hard at work at one of her seven industrial sewing machines. Located on a quiet street in Northwest Bend, there's a small sign indicating the home for her company, Rugged Thread Outerwear Repair. There's even an honor system drop-off box for repairs. This past October things changed when Kinney's achievements were recognized by the Bend Outdoor Worx Venture Out Festival. Hurdling through three rounds of competition, including an initial 20-minute pitch, and a showdown on the Tower Theatre stage, she won the Ready to Roll Award, (growth stage category). The prize? A cash grant of $75,000. "I needed some wild spirit. I have a wild spirit and I just needed to be outside, and Minnesota was not a place to be outside." But she kept on the move and in 1988 ended up at Snowbird, where she started working on ski suits and other snow apparel. That stint turned into about six years and was the foundation of Kinney's busy career repairing outdoor gear of all types. Besides herself, there is one part-time employee, but Kinney hopes to increase this to three within the next year or so. "I could see us having a facility here to employ 40 people," in the next 6-10 years, she says. She's an advocate for a living wage, in which people are valued, and enjoy the work they do and the people with whom they work. This positive mindset and work environment then contributes back to the community, she adds. "I want to hire people who are smarter than me," Kinney says, by taking advantage of the courses and skills taught at COCC and OSU-Cascades. Kinney says that her repairs are now booked out to about the middle of January. The work changes with the seasons; now, it's mostly seam taping and other repairs on snow jackets and pants. In the summer it will be tents, sleeping bags and motorcycle clothing and packs. And is there a mindset change with larger corporations? Kinney says yes, with Patagonia and Carhartt leading the way, supplying her with bags of zipper parts for free. Dakine, Mountain Khakis, Osprey Backpacks and Timbuk2 are other eco-friendly brands she mentions. When not in the shop, Kinney enjoys spending time with her kids, as well as road and mountain biking, and most recently, backcountry skiing. She also enjoys reading, socializing and don't forget, listening to music—loudly.